"... a master of minimalist stagecraft." The Scotsman on 'Claustrophobia'. Sharon trained as a theatre director at CityLit under the tutorage of award winning playwright and director Simon Bowen. In 2014 she was selected for Springboard, a training programme run by the Young Vic's Directors Network. Participating directors included Natalie Abrahami, Ramin Gray, Mike Longhurst, Ian Rickson, John Tiffany, Lyndsey Turner and Theatre O. Other practical experience includes workshopping with Frantic Assembly and observing Max Stafford-Clark in rehearsal for 'Our Country's Good'. She has recently expanded her practice to experiment in digital installation, collaborating with You Are Already Dead at Camden People's Theatre. The results can be found online here. As a producer she has trained with Stage One and founded To The Moon in 2012. 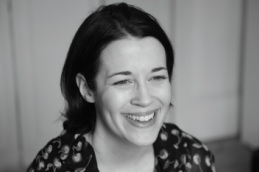 Sharon's directing work includes 'Old Fools' by Tristan Bernays (Southwark Playhouse), 'Claustrophobia' by Jason Hewitt at the Hope Theatre and Edinburgh Fringe Festival (read her interview with The Stage here); 'The Helen Project' (WOW Festival, Southbank Centre); 'The Merchant of Venice' (Goodmann Productions, Courtyard Theatre) which received praise for featuring a female Shylock. She has also directed several shorts at venues including Park Theatre (Park 200), St James Studio, Southwark Playhouse and The Arcola. She has also assistant directed on 'A Christmas Carol' and 'The Last Days of Judas Iscariot' at the John Lyon Theatre. She was one of the devisers of To The Moon's first production 'Silent Shakespeare' as well as producer. Stuart has worked with To The Moon on a number of projects over the years, and most recently has been a writer and now producer of their Laugh or Cry shows. Stuart is a comedy writer, and was accepted into the BBC Writers Room 2015/16, where he spent 6 months getting advice and masterclasses from those in the industry. Since then he has shown his writing at Laugh or Cry's Cruel Britannia show at the Lion and Unicorn in September 2016. He is currently developing a sitcom with a BBC Radio producer for BBC Radio 4. He is also the producer of Laugh or Cry's Speakeasy, a storytelling night where people share their hilarious and harrowing true stories to a room of strangers. Stuart trained as an Actor for 3 years at The Court Theatre Training company in London. He has worked in Theatre & Film, notably in ‘The Theory of Everything’. Other credits include a commercial for Liverpool F.C. and Subway, a featured artist in BBC One's Christmas Idents, and he played the lead, ‘Dave’, in the multi-award winning ‘Dave’s Wild Life’, including an award from Mike Leigh and entry into the Seattle International Film Festival. As a freelance arts technician, Tom has worked in nearly every theatrical department and is often called upon to create the unusual or impossible. He has been with To The Moon since 2013 and designed their most recent production - ‘Claustrophobia’. Tom trained at City Lit as a stage manager, designer and technician. He has since worked as a technician on shows including 'Personals: The Musical' (The Bridewell) and 'The Night Before Christmas' (The Ambassadors) and stage managed productions such as 'The London 50-Hour Improvathon' (Hoxton Hall) and 'The Terror Season' (Southwark Playhouse), where he was also Lighting Designer for the premiere of Neil LaBute’s controversial new play 'The Unimaginable'. Recently, he was the Tour Manager for ‘Knightmare Live’ (venues included The Lowry, Aberdeen Music Hall, Lyric Shaftesbury). Tom worked as the Technical Manager at The Courtyard Theatre in Hoxton and during his time there the space hosted top UK theatre and television companies, among them ALRA, The Globe Theatre and ITV. He is currently the Technical Director and Production Manager at Theatre N16, a new arts and performance space in Balham that he helped set up from scratch. Outside of the venue, Tom now works primarily as a technical supervisor and consultant for both theatre and television. He was a technical consultant on comedy/video game panel show ‘Dara O’Briain’s Go 8-Bit’ for the UKTV channel Dave, and has just finished working on the installation of a state of the art theatre for Ibstock Place School in Richmond. As an art director, he has worked for BBC Comedy Online and on feature films including award-winning director Steve Balderson’s 'Culture Shock' (Dikenga Films) which premiered at Raindance Film Festival. His special-effects credits include 'Terror: Love Me to Death' (Soho Theatre), 'Real Horror Show' (Leicester Square Theatre) and British horror film 'The Zombie King' (Northern Girl Productions) starring Corey Feldman and Edward Furlong. ​Tom directed, designed and curated immersive B-Movie experience 'The Midnight Movie Theatre', seen in Edinburgh and Leicester Square. Anto moved to London from Sardinia, Italy and after abandoning a career in journalism she trained as an actor and a theatre maker at London South Bank University. She landed her first professional acting role in “Cause For Alarm” by Deborah Klayman (Whoop’n’Wail) Waterloo East Theatre in December 2014. In September 2015, she joined the Script Accelerator programme run by the Park Theatre where she met Sharon and worked alongside her as assistant and designer on “The View” by Steve Arber. She aspires to be a playwright and a theatre director and she is thrilled to begin her career with To The Moon, with whom she shares the love for the darkest side of human psyche. Her passion for experimental theatre, combined with an interest in multimedia performance, pushes her to find new ways of doing and seeing things, all things. Anto is also known as a singer-songwriter and composer under the name of Anto Dust. She toured Europe with her band and is now currently working on her debut album due out in Spring 2016. Her music received international acclaim and a string of great reviews from radio and press. To hear for yourself, click here. Samuel joined the team of To The Moon in 2017. ​He trained at the University of Winchester in contemporary performance and went on to become a resident director and producer at fringe venue The Stage Door in Southampton. He produced and directed over 14 productions, and went on to become a member of the JMK directors scheme at Salisbury Playhouse. His directing/producing work includes Blues In The Night (Hippodrome), Into the Woods (Salisbury Playhouse), American Idiot, Dogfight and Rent (The Stage Door). As associate producer, he has assisted with ‘Divallusion’ and ‘Party of One’ both starring singer impressionist Christina Bianco (Edinburgh Fringe). In 2016 he joined the company of the smash hit magic show ‘Impossible,’ sharing a stage with some of the greatest magicians in the world, both internationally and in the West End. Festival amongst others. It is currently being streamed on the Comedy Central website. She co-wrote her first feature "The Photographic Memory Recalls the Highlights of the Year," with Tom Betts, based on her short of the same title, for Western Edge Pictures. It is being supported by The Wellcome Trust Development Awards.